+++I’m visiting my family in Washington. I’ve only been at my mother’s house for about four hours, but I’m already reaching for a couple of beers. I take them from the outside fridge, and speed past barking dogs and bickering relatives to my mother’s deck. I close the sliding glass door and suddenly it’s quiet. I light a citronella candle to fend off mosquitoes and crane flies, sit myself in a lounge chair out of sight from my family, and take in the sunset over Puget Sound. +++I have this one rule: I don’t drink alone. Except for beer. Why does beer get a pass? Because I’m an enthusiast, truly an embarrassing nerd about it at times. Certainly, I drink it to diffuse, to drown out the sounds of relatives discussing their gastrointestinal ailments. But I like to think of beer as something to be tasted rather than simply drunk. +++My first beer of the evening is a local imperial India Pale Ale. I pour it into a tumbler glass with laser etchings on the bottom to better release its bright, floral aroma. I take a moment to look at the cloudy, golden haze that is typical of the style and nearly put my nose into it, getting a sneak preview of its lemon and lime flavor. I take a sip, move it about my palate, realizing how I absurd I must look and remind myself I made the right choice in drinking it alone. +++As it goes down, I breathe out, and try to detect any hidden remaining flavors. Much like Maya Randall in Sideways, the more I have of this beer, the more I like what it makes me think about. I think about the life of beer, the ephemeral flavor of hops, live yeasts budding, and the soft water. Most importantly, when I have a fine beer like this, I like to think of where every part of it must come from, its story, and the history behind it. +++Hell, it doesn’t even have to be a fine beer. +++When I finish, I take a look at the empty bottle and laugh a little. After all, it’s just beer. Of all the things to take less seriously and enjoy more, it should be this one thing. +++The other beer I grabbed from the fridge is a 24 ounce can of Rainier. +++The brewery that’s older than Washington itself. The adjunct lager of the Pacific Northwest. Vitamin R. Rahn-yay. “The beer from here.” The beer a bear in Baker Lake drank 36 cans of after being unable to stomach one Busch. 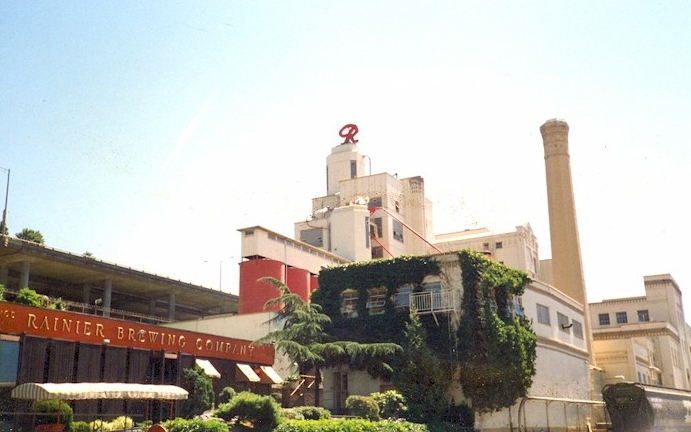 When I come home, even though it’s long gone, I still expect to see the brewery as it was, with its rotating neon “R” in the Seattle night sky. +++I don’t bother with the proper glassware, and crack the can’s pull-tab, taking a long drink. Sweet grain, straw flavored, crisp—your typical macrobrewed lager. Despite its bland taste, whenever I’m home, I just have to have one. I hate myself for it, for letting memory and nostalgia override what I know to be true. +++It’s hard to tell when Rainier stopped being “The beer from here.” Was it in the early 1970s when Molson Canada bought shares and took more control? In 1977, where it would be stuck in investment hell for 14 years? Maybe in 1996, when it was decisively in the hands of Stroh’s? But even throughout that time when Rainier was changing hands, quality was still its main concern, its recipe intact, with the exception of higher quality grains and improved brewing equipment. +++For me, Rainier stopped being Rainier in 1999, when it was shut down shortly after Stroh’s was sold to Pabst Brewing. It died a dignified death, going out on top with a Gold Medal for American Pilsner at the Great American Beer Festival the year before. +++So if Rainier is dead, how am I nursing a tallboy of it today? +++A funny thing happened about six years back. I was driving with my father into downtown, listening to a classic rock station, when we heard the sound of a motorcycle loudly revving “Rainier Beer.” My father burst with laughter, nearly bringing himself to tears and took a deep breath, telling me I was too young to understand what was so funny. I later learned that it was the resurrection of a popular advertisement from the 1970s, a part of Seattle’s collective memory. Word spread fast amongst those my father’s age in the Northwest: Rainier was back. +++After the brewery closed, the brand and recipe was sold to Olympia, another well-known Northwestern brewery in nearby Tumwater, Washington. However, in 2003, it too would be shut down after Pabst was taken over, with its and Rainier’s recipe and rights sent to SABMiller in Irwindale, California, where it is currently brewed. +++Oh, Vincent. You know better. +++So how did Rainier stop being Rainier? What did it in exactly? +++ Peter Blecha’s article “Rainier Beer – Seattle’s Iconic Brewery,” states that traditionally, competition in the beer market was once more localized. Rainier originally was only competing against regional rivals such as Olympia and Oregon’s Blitz-Weinhard. By the 1970s, however, national brands such as Coors and Anheuser-Busch started to enter the Northwest markets. To stay alive and stay big, Rainier aligned with Molson Canada, increasing Molson’s holdings in Rainier to 49%. +++Blecha goes on to say that by the 1980s, despite its loyal customers and increased variety of beers, the re-emergence of micro and craft breweries, in addition to the national brands, began to take a mortal toll on Rainier. The passing of the brewery between nameless and far-off investment firms didn’t exactly do much to help the dying company. +++Two-pronged competition, no doubt, had a hand in Rainier’s decline, but Paul Shipman, founder of Redhook Ale Brewery in nearby Woodinville, brings light to something that deserves more attention. According to the Seattle Post-Intelligencer, Shipman is quoted as saying that Rainier was, “Too small to be big and too big to be small.” At its peak, Rainier had a production capacity of 1 million barrels, far below the staggering 180+ million barrels of SABMiller’s annual production, but enough to be between the Boston Beer Company (2 million) and Sierra Nevada (780,000), considering independent breweries. +++I know Abbey is referring to the increased accessibility to parks and wilderness as a bad thing, but with the faint scent of Rainier still on my mustache, I can’t help but think about how well his quote applies to beer. +++Rainier was never considered a microbrewed or craft beer, at least not for the past 100 years. But it was representative of place, of collective Northwestern identity, and once a true product of the land. After all, before Rainier was reanimated by SABMiller and sold to me in its current form, it was once brewed at the bottom of Seattle’s Beacon Hill, with water straight from the brewery’s spring, and grains from the south side of the city. +++Beer and its roots are inextricably linked and the moment that link becomes severed or forgotten, or a brand becomes too big, the integrity of the product can be called into question. Rainier was far from the only beer obtained by Pabst Brewing and sold back to its own population. Looking at its portfolio, Pabst Brewing has the rights to other iconic brands, such as National Bohemian of Baltimore, Lone Star of Texas, and Schlitz of Milwaukee to name a few—all brands that died in their areas and were resurrected by this parent brewery. +++But beer drinkers abhor a vacuum as much as an empty pint glass. Where those breweries fell in Seattle, Baltimore, and Texas, craft breweries such as Elysian, The Brewer’s Art, and Shiner/Spoetzl have taken their place. Like the regional macrobreweries in the 19th century, these artisan breweries take much from the land around them: The water in Elysian’s beer comes from the Cascade Mountain snowmelt, their hops from nearby Yakima Valley. The Brewer’s Art Sun King Mild uses a blend of grains solely from the Chesapeake Bay area. Shiner’s seasonals of Holiday Cheer and Redbird all use Texas grown pecans, peaches, and Ruby Red grapefruit. +++Such products almost scream niche. But with overall craft beer production up 14%, and sales up by 15% in just the first half of last year, it hardly seems fair to call its market a niche anymore. Thanks to craft beer, a renaissance of the world’s oldest beverage is in full swing, and what happened to Rainier may never happen again, with Anheuser-Busch, SABMiller, and Molson Coors all running scared. +++But there’s something troubling on the Pabst Brewing portfolio. One of their holdings is Southampton Ales and Lagers of New York. Like the aforementioned adjunct lager breweries, Southampton has roots in its region, listing Babe Ruth, Cary Grant, and Clark Gable as its regular patrons in the days of prohibition. Unlike those adjunct lager breweries, Southampton is a smaller craft brewery specializing in Altbiers and Double White Ales. Lenn Thompson of New York Cork Report, despite expressing happiness for Southampton’s success, worries about the risk quality faces when a larger conglomerate is suddenly handling a smaller brewery. +++When we buy Southampton, are we buying a product of the Mid-Atlantic? Or are we simply paying for the name? Although Southampton’s Phil Markowski will stay on as head brewer, Thompson’s fear of this cannibalization is legitimate. Big Beer isn’t running scared. It’s adapting. +++Take for example Goose Island Brewing of Chicago. Early last year, the critically acclaimed brewery, long looking to expand, joined the Craft Brewer’s Alliance. Anheuser-Busch already had a 32% stake in Goose Island, then bought the company outright for $40 million. David Roeder of The Chicago Sun-Times asks, by selling itself to the largest brewer on the planet, has Goose Island sold its craft-brewed soul? After all, with Anheuser-Busch’s purchase comes the departure of head brewer Greg Hall, the mind behind the brewery’s unique styles of bourbon-barrel aging and wild fermentation. +++ Hall acknowledges things will change, but that Goose Island will continue to evolve by introducing new brands. John Hall, founder of the brewery and Greg’s father, says in response to the criticism of the deal, “Everyone should relax.” Dave Peacock, president of Anheuser-Busch, acknowledges that Goose Island beers are the hometown pride of Chicagoans and they are interested in keeping the model the same as they expand. +++Distribution of Goose Island products will inevitably spread. Thanks to Anheuser-Busch, the brewery’s Sofie Saison and Bourbon County Stout are now available for the first time in my hometown bottle shop. But it’s hard to see how change is for the better when the focus is on profit and attainability rather than evolution. +++I’m concerned about the soul of Goose Island and its status as a Chicago institution. Will it be like Rainier? Marketed as a beer from there? +++John Hall says the deal represents a “commitment to Chicago,” but with its Honkers and India Pale Ale now being brewed in Washington State, and its 312 Urban Wheat in New York, I find that hard to believe. +++Growth for growth’s sake. It’s the only way, right? +++Being cannibalized by Anheuser-Busch, SABMiller, or Pabst isn’t the only route regional or craft beer has to take. In fact, Dogfish Head and Flying Dog, two prominent craft breweries not unlike Goose Island, went a different path entirely, valuing what looks like the soul and quality of their product over profit. +++Remember this: Beer drinkers abhor a vacuum. In the age of information, when you sell out, we find out and react accordingly. +++Ben Worcester of Huffington Post, after giving his two cents on the Goose Island acquisition, reminds Illinois drinkers they have alternatives if they’re not interesting in handing their money to Anheuser-Busch, such as Metropolitan Brewing and Three Floyds, in addition to Half Acre. +++I think of my own city, when Pyramid and Red Hook, Rainier and Olympia’s successors, were cannibalized by New York’s North American Breweries and the Anheuser-Busch-dominated Craft Brewer’s Alliance. We went to Elysian. We went elsewhere. +++Even better, sometimes we take it back. +++When I come home for a visit, I keep a list of things I want to do before I head back east. If I’m home in the summer, I typically make an effort to visit the Seattle Asian Art Museum, take in a Mariners game, and have a plate of halibut and chips at Spud’s on Alki. +++For the first time ever, visiting the Old Rainier Brewery is on my agenda. +++In 2010, ten years since beer was last made in the Old Rainier Brewery, local brewer Rick Hewitt and his Emerald City Beer Company reopened its doors, and started producing its flagship beer, Dottie’s Seattle Lager. +++“[Dottie’s] is an Amber Session Lager,” Hewitt says, “made from world-class local ingredients grown right here in Washington State.” In an interview with Washington Beer Blog, he notes that the grains are from the Palouse and the hops from Yakima Valley. When Hewitt remarks that his beer is “truly is a Seattle lager,” I can’t help but smile and think of what he’s doing as a middle finger to those that closed the door on Rainier, our heritage, when it became unprofitable. Previous postAlbums of the Year, Part 1: Fleet Foxes, "Helplessness Blues" Next postAlbums of the Year, Part 2: Frank Ocean, "Nostalgia, Ultra"
I drank a ton of Rainier at Doe Bay Fest this summer and never got more than “buzzed.” But I had a lot of fun (and Washington Pride) doing it. Excellent article! Thank you for so patiently telling the story of Rainier and what happened to the brand, how the beer from here is now made there. Or where ever. 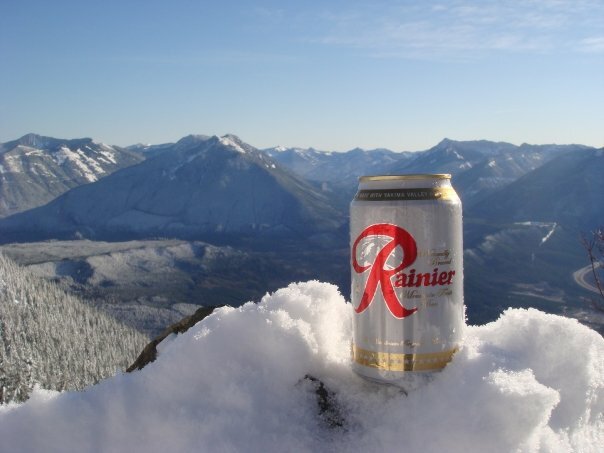 I dream of a day when the Powers That Be decide to retire the Rainier brand and let it go, or sell it, to a small, local brewery so we can one again drink Rainier Beer and know that it truly is the beer from here. That means a lot coming from you, Kendall. Huge fan here of what you do.